Brandon Coe’s overtime winner put the North Bay Battalion over the London Knights 4-3 Sunday afternoon at North Bay Memorial Gardens. The Knights pick up a point and remain in first place of the OHL Midwest Division with 66. Liam Foudy started the scoring for London at 5:39 into the opening frame, his 21st goal of the season. The Battalion then tied the game and took the lead before the period was out. Brad Chenier scored the equaliser, then Patrick Brown’s goal with 29 seconds left gave North Bay a 2-1 first-period advantage. The Knights came back with two goals in the second period. 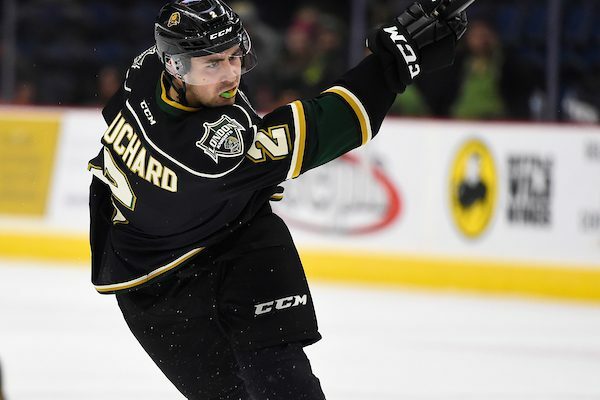 Evan Bouchard scored short-handed at 4:25, then William Lochead scored later in the segment for a 3-2 London lead after 40 minutes of play. North Bay tied the game again early in the third period when Matthew Struthers, forcing overtime. Coe’s game-winner came at 2:17 in the extra frame. Christian Propp stopped 37 shots out of 40 between the pipes for the Battalion. Joseph Raaymakers had 26 saves in goal for London. The Knights visit rival Windsor Thursday night.